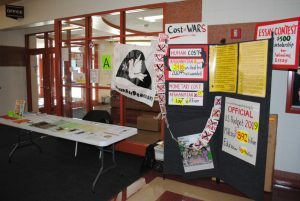 The counter recruiting display used at Southwestern Wisconsin high schools this fall, 2018. On October 23, Veterans For Peace Chapter 25 member David Giffey spent lunch hours at Richland Center High School speaking with students and staff about the costs of war. Literature on the table at left describes alternatives to the military including apprenticeship programs offered by building trade unions. Other high schools visited this fall include River Valley, Spring Green; Boscobel; Baraboo; Dodgeville; and Riverdale, Muscoda. This entry was posted in Clarence Kailin Chapter 25 on October 24, 2018 by Brad Geyer.